Success! Tayebwa from Uganda raised $249 for hernia repair surgery. Tayebwa's treatment was fully funded on November 1, 2016. Tayebwa successfully received hernia repair surgery. Tayebwa is doing great and his surgery was a success. He is currently at home resting with his family, and already feeling so much better. He has shared that he feels much less pain now and is more calm and peaceful. Now that his hernia has been repaired, he is no longer at risk of intestinal incarceration, obstruction, or strangulation. Tayebwa is a 27 year old driver from Uganda. He is married and the father of two children; a six year old boy and a four year old girl. They currently rent a place to live, but they bought a piece of land and plan to build a house for their family. His biggest wish in the future is to have a cattle farm and a car of his own. He likes animals and enjoys being with his family. Two years ago, Tayebwa started feeling pain in the epigastric region. Due to the pain, he is unable to sit for a long time or lift heavy items. He has never visited a hospital due to lack of money. If left untreated, Tayebwa may suffer many complications. $249 will fund the hernia repair surgery Tayebwa needs to be healthy. After the surgery, he plans to continue working as a driver and build a house for his family. “I want to work hard and build a house for my family. It will take time, but I will do it,” Tayebwa shared. Tayebwa's case was submitted by Joan Kadagaya at African Mission Healthcare Foundation in Uganda. Tayebwa was submitted by Joan Kadagaya, Curative Medical Support Program-Partner Representative at African Mission Healthcare Foundation, our medical partner in Uganda. Tayebwa received treatment at Holy Family Virika Hospital. Medical partners often provide care to patients accepted by Watsi before those patients are fully funded, operating under the guarantee that the cost of care will be paid for by donors. Tayebwa's profile was published to start raising funds. Tayebwa's treatment was fully funded. Tayebwa's treatment was successful. Read the update. Mwase is a farmer who lives with his wife and two children in Malawi. He spends his days working hard on his farm, so in his free time he enjoys just sitting and relaxing. Since November of last year, Mwase has been experiencing urinary difficulty. These symptoms are caused by an enlarged prostate, a condition called benign prostatic hyperplasia. He needs to undergo a prostate resection surgery, a procedure in which surgeons will remove part of the enlarged gland. Our medical partner, World Altering Medicine, is requesting $733 to fund Mwase's surgery. On March 21, he will undergo prostate surgery at Nkhoma Hospital, our medical partner's care center. The requested money pays for supplies, medications, and two weeks of hospital stay. He says, "This program is helping me very much and I really appreciate this help. Thank you!" Moeun is a 74-year-old rice farmer from Cambodia. She has twenty grandchildren, and in her free time she enjoys listening to the monks pray on the radio. 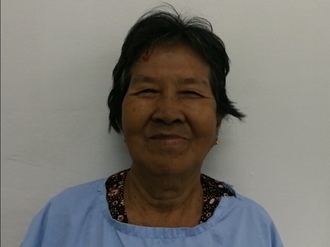 One year ago, Moeun developed a cataract in her right eye, causing her blurry vision. She has difficulty seeing things clearly, recognizing faces, and going anywhere outside. When Moeun learned about our medical partner, Children's Surgical Centre, she traveled for three and a half hours seeking treatment. On April 23, doctors will perform a small incision cataract surgery and an intraocular lens implant in her right eye. After recovery, she will be able to see clearly. Now, she needs help to fund this $211 procedure. She says, "I hope my surgery is successful so I am able to help take care of my grandchildren and attend the ceremonies at the pagoda."